Concerning Phoebe: The Women’s Diaconate | Language For You! Today, I wanted to expand on something I posted on Fr. Tom Reece, S.J.’s Facebook page in response to an interesting story. Before that, however, I cannot omit to rejoice in the Recent Supreme Court decisions to uphold the Affordable Care Act, and also on Marriage Equality. I am equally delighted that they have also re-affirmed Religious Liberty. No Religious institution will ever be forced or coerced into performing a ceremony they do not agree with in this Land of Freedom. If we need any proof, here it is: Marriage between a Man and a Woman is legal in this Country. In the Roman Catholic Church, a person who has been married in the Church and then civilly divorced, but who has not received a Church Annulment, cannot marry again in the Church. Have you ever seen the Roman Catholic Church forced to perform a wedding in which one of the partners was divorced but who had not received an annulment, even though such marriages are perfectly legal in civil society. Churches who oppose Interracial Marriage (however abhorrent they may be) are not forced to perform them. Use this argument if anyone fear-mongers about this. My project here is to lay out why the Commission is wrong, and their probable underlying motivation for doing so (perhaps unconscious, as I am sure they are good people). The issue has come up again as Bishop Leo O’Reilly of Kilmore in the Republic of Ireland, has urged his fellow Bishops to create a Commission to study the possibility of the Ordination of Married Deacons to the Priesthood, and the Ordination of Women to the Diaconate. I wish him well, and pray that he is successful. I commend you to our sister Phoebe, who is deaconing in the Church of Cenchreae. — Romans 16:1. Now this in itself is not conclusive, as the Greek word διάκονος (diákonos) meant a male or female servant before Christianity. However, as the Churches evolve and get organized, the meaning becomes crystal clear. There are also the Deaconesses Lydia and Dorcas in the New Testament. 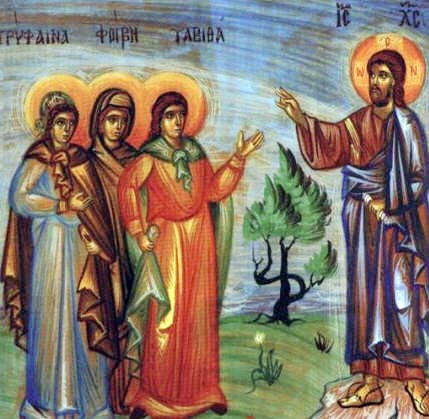 To specifically refer to Women Deacons, one would say διάκονοι γυναῖκες (diákonoi gynaîkes). And that’s exactly how the Emperor St. Justinian’s legislation puts it in the 5th Century. So does St. John Chrysostom, the Archbishop of Constantinople (4th Century), whose close friend and supporter was the Deaconess St. Olympia, and Theodore the Interpreter, of Mopsuestia (4th/5th Century). “Appoint a woman for the ministry of women. For there are homes to which you cannot send a male deacon to their women, on account of the heathen, but you may send a deaconess … Also in many other matters the office of a woman deacon is required.” Wikipedia continues, paraphrasing: The bishop should look on the male deacon as Christ and the woman deacon as the Holy Spirit, denoting their prominent place in the church hierarchy. There are many other texts, which you can find here, and I will try to summarize the history. As things evolved, Deaconesses were involved in many Sacramental ministries in many different Churches, such as assisting the Priest or Bishop with the full immersion baptism of women, just as Deacons did with male catechumens, distributing the Eucharist to the Faithful as did deacons, and even, in some places, anointing women who were ill, one of the Holy Mysteries (Sacraments). Their Ordination ceremonies were almost identical to those of male Deacons. 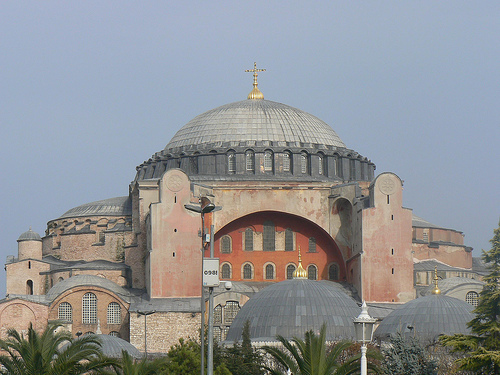 In the Church of Constantinople, both male and female Deacons served Divine Liturgy at the Great Church of Hagia Sophia on a regular basis, along with the Presbyters (Priests) and Bishops. In Constantinople, Jerusalem and elsewhere in the East, the Deaconesses continued, and only began to decline in the 11th Century. The fully sacramental Deaconesses never completely died out in Russian Orthodox monasteries, and in other places in Eastern Europe. The Order was revived in Greece by St. Nektarios of Aegina in 1911 for monasteries, and it continues today. According to Byzantine liturgical texts, the ordination of the woman deacon occurred as any other ordination to major orders. It took place during the celebration of the Eucharist and at the same point in the service that the male deacon was ordained. She was ordained at the altar by the bishop, and later in the service, received Holy Communion at the altar with the other clergy. Depending upon the need, location and situation in history, the deaconess ministered primarily to the women in the community in much the same way that the male deacon ministered to men…. [The order] was gradually de-emphasized sometime after the twelfth century. It should be noted, however, that there does not exist any canon or Church regulation that opposes or suppresses the order. The argument against the Ordination of Women to the Diaconate rests on the following presumed distinction. The fact is that the two Greek words cheirotonia and cheirothesia were used interchangeably for centuries in the Churches. And in addition, we can use a phenomenological approach to disprove the distinction. One path of Christianity phenomenology is called Mystagogy, teaching through the Holy Mysteries. Pope St. John Paul II was a phenomenologist, philosophically. In the Byzantine Liturgical Tradition, Minor Clergy (Cantors, Readers, Acolytes, Sub-Deacons) are tonsured for ministry outside the Iconostas. Presbyters can confer this on all but Sub-Deacons. Major Clergy are Ordained by the Bishop inside the Holy Place, behind the Iconostas, at the Altar. This is something that Westerners would not pay attention to, but it is of primary importance in Eastern Mystagogy. Ordination of an orthodox priest. The deacon being ordained is kneeling at the south west corner of the holy table and the bishop places his omophorion and right hand on the deacon’s head and his left hand over his right hand so as to make a cross, while reciting the prayers of Cheirotonia (laying on of hands). © 2010 Lipsio. As we saw from Presvytera FitzGerald’s citation above, Deaconesses were, and are Ordained in the Holy Place, behind the Iconostas, at the Altar, by the Bishop. No less that the Double-Cross Mitered Archimandrite Robert Taft, S.J., once commented on this question, in his inimitable fashion: “If it walks like a duck, and looks like a duck, and quacks like a duck: it’s a duck.” And he is the leading Eastern Liturgical scholar in the world. We can conclude that the clear Sacramental nature of ancient and modern Deaconess’s liturgical service and ministry, that they were Ordained with the Laying On of Hands. 1. 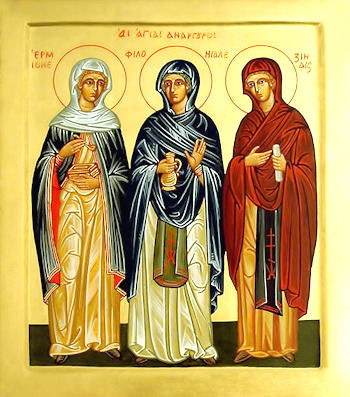 From the discussion above, it is clear that ancient Eastern and Western Deaconesses and modern Eastern Deaconesses were/are actually Sacramentally Ordained. 2. The Roman Catholic Church and the whole Catholic Communion of Churches categorically and without reservation acknowledge that the Eastern Orthodox Communion of Churches is a valid Church, possessing real authority to act and ordain. 3. Therefore the Ordinations of Women to the Diaconate are both valid and licit. Why, then, the Opposition to the Women’s Diaconate? First, of course, there are the Church’s sad lapses in the realm of mysogyny (Ancient Greek μισογυνία (misogunía) and μισογύνης (misogúnēs, “woman hater”), from μισέω (miséō, “I hate”) + γυνή (gunḗ, “woman”). ‘Nuff said on that: it isn’t universal, but it happens all too often. If Ancient and Modern Deaconesses were truly Ordained with the Laying On of Hands, then that means that there is no Ontological, Divine block to Women being Ordained. It is human custom, not Divine Law, just like Married Deacons not being ordained priests in the Roman Church at this time. All other arguments against Women’s Ordination are cultural, human, historical and contingent. The only thing standing in the way of full participation in the three degrees of the Priesthood (Deacon, Presbyter, Bishop) is the theory that women cannot be Ordained by Divine Law and human ontology. It’s not that they should not be ordained, they cannot be. In this regard, I will share a favorite anecdote: A crotchety old priest once visited our Novitiate in Montecito CA. A number of us were at table with him one day. He startled us by commenting on the Anglican Ordination of Women to the Priesthood when he said, “It is so repugnant that a woman should be ordained, that if she attempts to Confect the Eucharist, she will explode.” You can imagine how we repeated that story! This acknowledgement of the Ontological possibility that a woman human being indeed can undergo “the Ontological Change” of ordination would be a real problem for the Roman Church. Immediately the question will then be: why don’t we do it? The symbolic, cultural, human, historical and contingent arguments are not very convincing. The Roman Church is known as the Church of Lawyers, and they would be in a bind. The Orthodox Church is not in the same boat. First, they clearly have Ordained Deaconesses. Second, if asked why there are no Women Presbyters or Bishops, they are very comfortable with saying, “It’s not the tradition of the Church.” Only a full Council could change that. I look forward to reasoned discussion in the Catholic and Eastern Orthodox Communions of Churches on this topic. It is on the agenda of the 2016 upcoming General Council of Orthodoxy. If the Orthodox Churches re-establish Deaconesses in Parish life (not just in Monasteries), this would really put the pressure on Rome. Let’s wait and see. I certainly cannot say for sure what will happen on this and related issues. I kind of think that Pope Francis’s priorities aren’t in this direction, but who knows? As to the Orthodox Council, it might just expand the role of Deaconesses. In the long run, and I expect these Christian Churches to be around in the long run–unless we exterminate all human life in any of several ways–I expect that Married and Single men and Women will serve in all positions in the Church. I remember in Babylon 5 how in early 2267, Pope Bernadette II called for a day of prayer, and a scientific search for a cure for the Drakh Plague. It may be that one of the Divine roles of the Anglican Communion of Churches is to be the forerunner of these matters. Pingback: When Equality Feels Like Oppression | Language For You!